Heat oven to 400°F. In medium bowl, beat all crust ingredients with electric mixer on low speed until crumbly. Pat dough in bottom and 1 1/2 inches up sides of ungreased 9-inch springform pan. Bake about 7 minutes or until golden brown. Cool 5 minutes. Reduce oven temperature to 325°F. Beat cream cheese in large bowl with electric mixer on medium speed until smooth. Beat in 1 cup brown sugar until creamy. Beat in eggs, butter flavoring and vanilla, scraping bowl occasionally, until smooth. Pour into partially baked crust. Bake about 1 hour 10 minutes or until center is almost set. Cool 15 minutes (center will sink slightly). Meanwhile, heat chocolate chips and whipping cream in 1-quart saucepan over low heat, stirring constantly, until melted and smooth. 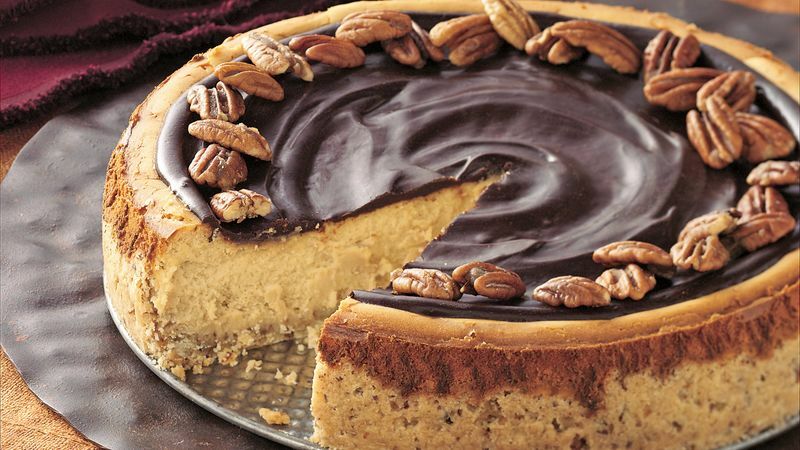 Spread chocolate glaze on top of cheesecake. Heat 1 tablespoon brown sugar, 1 tablespoon butter and the pecan halves in 8-inch nonstick skillet over low heat, stirring frequently, until sugar is melted and pecans are toasted. Spread on waxed paper; cool 5 minutes. Arrange sugared pecans along edge of top of cheesecake. Cool 2 hours at room temperature. Refrigerate 4 hours or overnight. Run metal spatula along side of cheesecake to loosen; remove side of pan. Store covered in refrigerator.